Ilse Zhalina has left to start a new life, leagues from her estranged lover, Raul Kosenmark. The quarrel that ended their relationship was quite public, and quite fake. They hoped to mislead Raul's enemies so he could continue to influence the politics of the kingdom and stave off an ill-advised war, while keeping Ilse safe. Ilse longs for Raul but is set on her own quest to find one of the three fabled jewels of Lir. In her search, she encounters a woman who has one jewel in her keeping. The two women become allies in their quest for the other jewels, because finding and controlling these stones could mean salvation for both of their nations. And their failure, the ruin of their peoples." 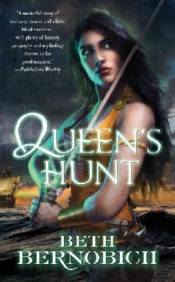 Queen's Hunt "is the stunning second installment in Beth Bernobich's "River of Souls "trilogy.